Though it’s possible for a collision repairer to establish a federal apprenticeship program today, Republican President Donald Trump’s new executive order might make the process even easier. On top of Pell grants, the federal government in fiscal year 2017 spent $16.7 billion on 13 agencies’ combined 43 job-training programs, but “many of these programs do not work and must be reformed,” according to the Trump administration. “These Federal programs must do a better job matching unemployed American workers with open jobs, including the 350,000 manufacturing jobs currently available,” the executive order states. 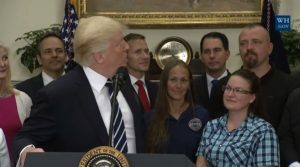 This could include a way for such entities to recognize “high-quality apprenticeship programs” (which we suppose would mean ones acceptable under federal apprenticeship laws) as well as “guidelines or requirements that qualified third parties should or must follow” when recognizing these programs, according to the executive order. Such a program could be fast-tracked and have an easier time registering for the federal registered apprenticeship program currently in existence. Overseen by the Department of Labor, the program recognizes apprenticeships which meet certain criteria set forth in United States Code. Though it’d probably be nice to have a less burdensome and involve means of qualifying an apprenticeship program, a collision repair business or trade group can set up a registered apprenticeship today. Dozens of employers are listed as offering apprenticeships for an “automobile body repairer.” (Two entities related to a Tennessee county’s corrections programs also list apprenticeships for “auto body repairer help.”) They include corrections agencies, high schools and individual auto body shops in multiple states. Besides the ability to fill an open position and bring in more revenue, businesses in certain states can qualify for tax credits and employee tuition, according to a fact sheet aimed at skilled trade employers. Find out how to establish one at your own business with a Department of Labor “Quick-Start Toolkit” here. Learn what federal resources (i.e., money) might also be available to your apprenticeship program here. A business would work with either a state or federal agency during the course of an apprenticeship. Find out your state’s contact and get help with establishing your program here. The national apprenticeship program can be reached at 202-693-2796 or oa.administrator@dol.gov. Finally, register your apprenticeship here. More details can be found on the employer portal and the homepage of the ApprenticeshipUSA website. Trump also ordered Acosta to create and run an Apprenticeship Expansion panel vice-chaired by Commerce Secretary Wilbur Ross and Education Secretary Betsy DeVos. The body would have no more than 20 members from various business, educational or labor organizations and recommend ways to encourage apprenticeships (including cutting red tape). It’d be pretty fantastic to get a member of the automotive aftermarket on there.